Nostalgia. A wistful desire to return in thought or in fact to a former time in one’s life, to one’s home or homeland, or to one’s family and friends; a sentimental yearning for the happiness of a former place or time. It happens to me occasionally, that I long for the past. For moments that I’d want to relive. Good times, but also times that have felt less fortunate. Times that have been, or perhaps might have been. Many times these feelings are being triggered by something else. For instance; that feeling that you can get when looking at old high school pictures. I remember that at that time I never really felt good about myself or my body. It saddens me a little bit that I spent so much time worrying about my appearance that I wasn’t able to see my own loveliness. Or that feeling that you can get when visiting the town you grew up in. When I visit the north of our country (which, I have to admit, I don’t do very often), I can’t help myself but to look back to the great childhood I’ve had there with my parents, my younger brother, my friends (some of which I still see). To the first time I was able to ride a bike without training wheels. The first time I was allowed to go to the swimming pool by myself (years later my mom told me she followed me the first time, because I had to cross a busy street and she wanted to be sure I was safe). The first time I fell in love. Or the first time I thought I did. The many hours I spent on the pitch (I played korfball for 20 years, Google that ;)). The many hours I spent playing in the park. The many hours I spent studying in my attic room. Looking back at these pictures also triggers nostalgic feelings. Not because they were taken in the Frisian village I grew up in (on the contrary, they were taken just around the corner of the office I spent many hours a week in), but because I came to realise that my sense of style hasn’t really evolved since my younger years (same for the surroundings: on the pitch or bleachers next to it ;)). 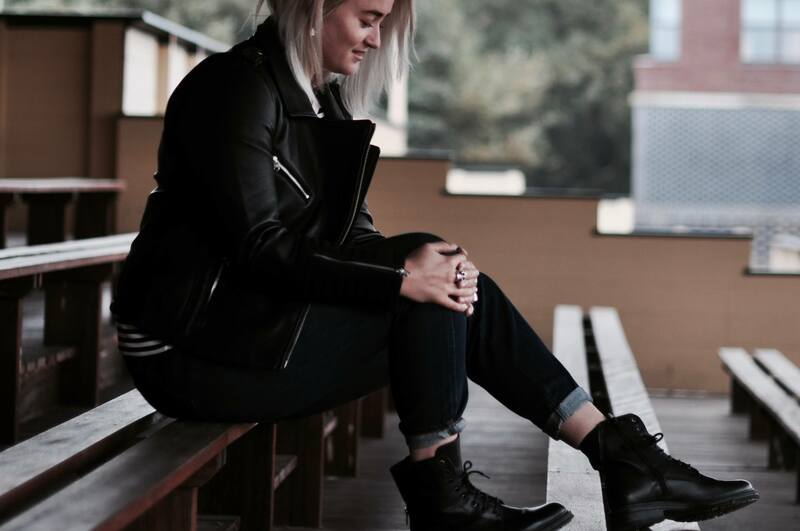 I’ve always had this thing with chunky boots, loose jeans, striped tops and leather jacket. In short: I’ve always had this things with basics. Classics, as you wish. It puts a smile on my face. And I’m pretty sure that will never change. Top outfit! Past ook perfect bij jou! Love the Fabio Deveraux boots. Personally, I love to wallow in feelings of nostalgia. One of my favorite feelings oddly enough.